Scott Halasz | Greene County News Vicky Rose shows off the pre-kindergarten classroom at the Rosewood Learning Center. JAMESTOWN — A popular home-based learning center is expanding into the middle of Jamestown. Formerly known as Teddy Bear Preschool, Rosewood Learning Center is set to open at 88 Seaman Drive, next to the library, Tuesday, Sept. 4. 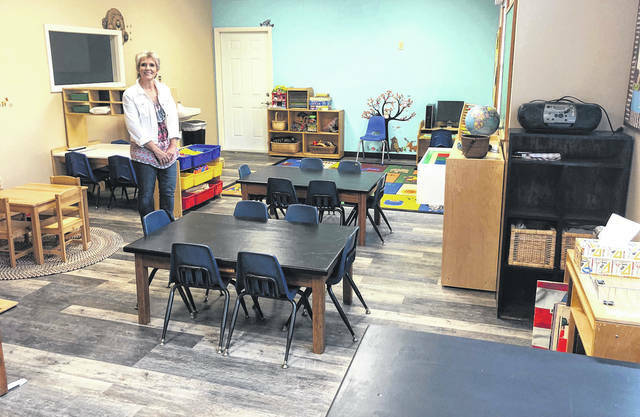 Rosewood, owned an operated by Vicky Rose, offers childcare, before and after school care (up to fourth grade), kindergarten enrichment classes, tutoring services and a summer program. The learning center focuses on pre-kindergarten (Woodland Wonders), but it offers classes for kids two-and-half years through four years (Barnyard Buddies and Jungle Jammers). Preschool options include daily, two or three days and half and full days. Meals and snacks are included in the tuition. Rose has been in education for 30 years and has spent 27 of them running a learning center out of her home. Operating it at home was the driving force behind the new location. “I couldn’t meet the demand anymore,” she said. “I had to turn people away.” Rose said she was looking into remodeling her house to facilitate the growing classes until she found the building, which used to occupy medical and dental offices. Having a larger preschool school filled a need in Jamestown, she said. “I really wanted to do something for the community,” Rose said. Teachers are experienced in early childhood education and have a bachelor’s or master’s degree or are working toward their child development associate certification. The facility is secure and features one-way windows so parents can see inside the classes, but kids can’t see out. A nurse is on staff as well. https://www.xeniagazette.com/wp-content/uploads/sites/32/2018/08/web1_IMG_1311.jpgScott Halasz | Greene County News Vicky Rose shows off the pre-kindergarten classroom at the Rosewood Learning Center.